Diagenode offers the broad range of antibodies raised against the N- or C-terminus of the Cas9 nuclease from Streptococcus pyogenes. These highly specific polyclonal and monoclonal antibodies are validated in Western blot, immunoprecipitation, immunofluorescence and in chromatin immunoprecipitation. ChIP was performed on NIH3T3 cells stably expressing GFP-H2B, nuclease dead Cas9, and a GFP-targeting gRNA. 50 µg chromatin was incubated overnight at 4°C with 5 or 10 µg of either an anti-FLAG antibody or the Diagenode antibody against Cas9 (Cat. No. C15200229). Mouse IgG was used as a negative IP control. qPCR was performed with primers specific for the GFP gene, and for a non-targeted region (protein kinase C delta, Prkcd), used as negative control. Figure 1 shows the recovery, expressed as a % of input (the relative amount of immunoprecipitated DNA compared to input DNA after qPCR analysis). ChIP was performed on NIH3T3 cells stably expressing GFP- H2B, nuclease dead Cas9, and a GFP-targeting gRNA. 50 μg chromatin was incubated with either 5 μg of an anti-FLAG antibody or 2 μl of the Diagenode antibody against Cas9. The pre-immune serum (PPI) was used as negative IP control. Then qPCR was performed with primers specific for the GFP gene, and for two non-targeted regions: Ppap2c and Prkcd, used as negative controls. This figure shows the recovery, expressed as a % of input. Immunofluorescence: Hela cells were transiently transfected with a Cas9 expression vector. The cells were fixed in 3.7% formaldehyde, permeabilized in 0.5% Triton-X-100 and blocked in PBS containing 2% BSA. The cells were stained with the Cas9 antibody at 4°C o/n, followed by incubation with an anti mouse secondary antibody coupled to AF488 for 1 h at RT. Nuclei were counter-stained with Hoechst 33342 (right). 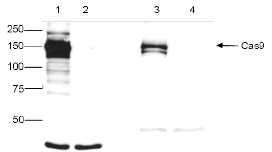 Western blot was performed on 20 μg protein extracts from Cas9 expressing HeLa cells (lane 1) and on negative control HeLa cells (lane 2) with the Diagenode antibody against Cas9. The antibody was diluted 1:4,000. The marker is shown on the left, position of the Cas9 protein is indicated on the right. 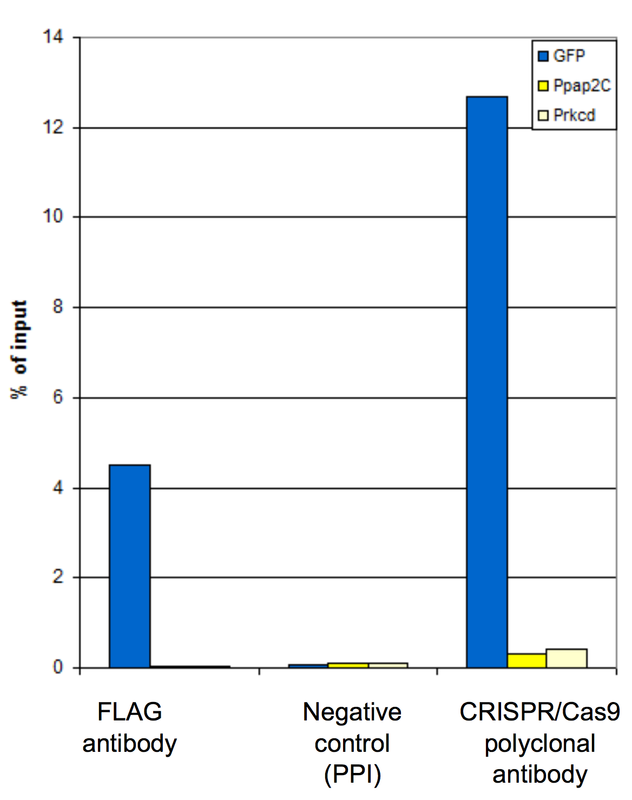 Which CRISPR/Cas9 antibody is the best for your application? (100 μg) IF IP WB Protein G purified monoclonal antibody. 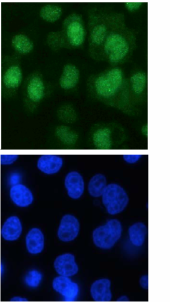 (100 μg) IF IP WB Protein G purified monoclonal antibody in PBS containing 0.05 % Na-azide. (100 μg) IF IP WB Protein A purified monoclonal antibody.